Ganredhel is a Bosmer acrobat in Cheydinhal who offers advanced training in Acrobatics. She is a passionate dog lover and owns two, Daisy and Luna. Even if she is not a member of the Thieves Guild, she apparently has an acquaintance with the Gray Fox, as you will have to meet up with him in her house during the Boots of Springheel Jak quest. She sleeps on the second floor of her house and rises early at 4am. The first six hours of the day sees her strolling around her house with her dogs. She leaves at 10am and heads for Borba's Goods and Stores, hangs out there until noon, then goes back home to her dogs. She leaves again at 2pm, this time to visit Newlands Lodge. At 4pm, she moves on and enters the Great Chapel of Arkay for a quick prayer before dinner. At 6pm, while still in the Chapel, she will begin searching for food and if any of the inhabitants possesses some, she will go into Sneak mode and steal it. If she succeeds she will sit down on a pew and eat for two hours. At 8pm, she goes back home for two hours of quality time with her beloved dogs until she jumps into bed at 10pm. She will offer training at all times except when she is asleep. She wields a steel dagger and wears a set of common lower class attire, specifically a burlap vest, sack cloth pants, and stitched leather shoes. She carries around her house key and a small amount of gold. The citizens of Cheydinhal are well aware of her acrobatic skills, as well as her enthusiasm for dogs. When asked about rumors, they will say: "Ganredhel sure does have a knack for training dogs. I've heard that she will train people as well, for a price. ", "Ganredhel can teach you about Acrobatics, for a price. Of course, she'd rather be training her dogs. ", "Have you ever spoken to Ganredhel about dog training?" and "Did you see Ganredhel training her dogs yesterday? She's got a knack for it." Others will just comment: "Ganredhel does seem to love her dogs. She taught me a little something about acrobatics, though, which was helpful." and "She's a very demanding teacher. You can learn a lot from her, if you're willing to try." What her fellow townsfolk are suggesting becomes very clear when you approach her for the first time: "Ganredhel. I train dogs. And people. Prefer dogs. People, I teach them Advanced Acrobatics. Up and jump. Dogs, I teach them to bite people." She will tell you more, if you ask her about her city of choice: "You got your people, and you got your dogs. Dogs are loyal and stupid. People are smart and devious. I'll stick with dogs." Being an advanced trainer, Ganredhel can give you the necessary reference to receive training from master trainer Torbern. 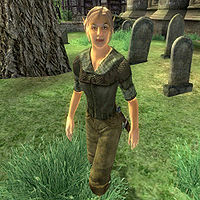 Once your skill level reaches 70, speak to her about training and she will point you towards Aerin's Camp with these words: "If you require further training, you might consider venturing into the mountains in the north of Cyrodiil. Aerin's Camp, specifically. Aerin's a very gifted acrobat, and could teach you anything you needed to know." Esta página foi modificada pela última vez à(s) 22h51min de 14 de agosto de 2013.